I was feeling creative today so thought I would attempt some nail art inspired by Zooey Deschanel. Zooey tweeted a picture of her nails at the Golden Globes last week to show her nails painted in Black and White Tuxedos, however I used grey and black which I much prefer. I painted one coat of grey polish (or you could use white) and then carefully painted a thin black stripe at the smile line/nail tip - you can use either black polish or a black nail art pen to do this. Paint a small bow shape followed by three or four dots down the centre of the nail depending on how long your nails are. Practice makes perfect with this look, and I think the thinner the black tip the better. I finished off with a layer of Top Coat to protect. 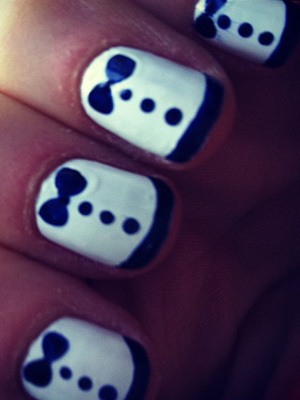 What do you think of Tuxedo Nail Art? Love these, definitely need to try this out! Lol @ liloo, that is exactly what I was thinking! :) Love the idea; like the black/grey combo better!